Thanks to a partnership with the Norwich ShopRite and United Community and Family Services (UCFS), Backus Hospital’s successful Rx for Health Program to help fight childhood obesity is now available during the winter months. Nine years ago, staff at the hospital identified obesity as a top health concern as part of its community health needs assessment and launched the Rx for Health Program to help families in need put fresh produce, herbs, eggs and whole grain bread on the table. Under the program participants receive “prescriptions” from local pediatricians that are redeemable for fresh vegetables and other healthy items offered at the downtown Norwich farmers market. Participants receive up to $100 in free healthy food each season. 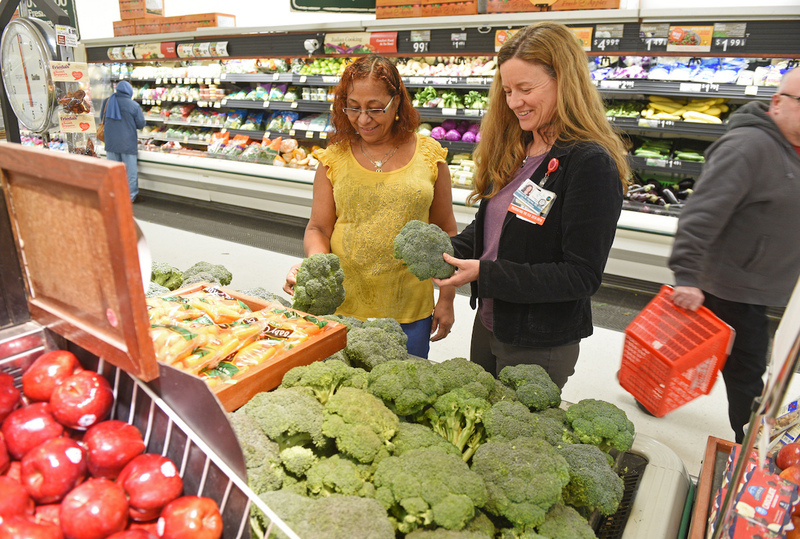 Because there is less availability of fresh produce during the winter months, Backus, UCFS and ShopRite have launched a five month pilot that allows participants to redeem prescriptions by presenting them at the ShopRite pharmacy to receive a $25 voucher each month during the winter. Participants are also given a folder with healthy eating information and recipes when they submit their prescription. Thirty five families who participated in the summer Rx for Health program are also taking part in the winter program. UCFS Care Coordinator Patty Passmore says the program is a great team effort. “For participants, they’re trying to do what’s best for their child. When they see that it’s Backus and ShopRite — two very visible organizations in the Norwich community — it just clicks for them,” said Passmore. Data from program surveys shows that the Summer Rx program has increased the number of days of the week that the children receive a daily fruit and vegetable by nearly 20 percent. Program participant Luisa Resende is the caregiver of her 14-year-old grandson. “It’s so helpful for us to buy healthy foods. The program is wonderful, just wonderful,” she said. The Rx for Health program is supported by the Backus Healthy Community Campaign. For more information about the Backus Healthy Community Campaign visit, https://backushospital.org/giving/annual-appeal.